Der Antrag an die National Science Foundation zur Entwicklung von Scratch. 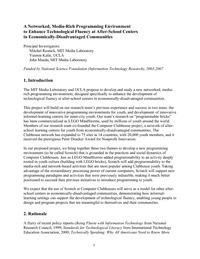 The MIT Media Laboratory and UCLA propose to develop and study a new networked, mediarich programming environment, designed specifically to enhance the development of technological fluency at after-school centers in economically-disadvantaged communities. This project will build on our research team’s previous experience and success in two areas: the development of innovative programming environments for youth, and development of innovative informal-learning centers for inner-city youth. Our team’s research on “programmable bricks” has been commercialized as LEGO MindStorms, used by millions of youth around the world. Members of our research team co-founded the Computer Clubhouse project, a network of afterschool learning centers for youth from economically-disadvantaged communities. The Clubhouse network has expanded to 75 sites in 14 countries, with 20,000 youth members, and it received the prestigious Peter Drucker Award for Nonprofit Innovation. In our proposed project, we bring together these two themes to develop a new programming environment (to be called Scratch) that is grounded in the practices and social dynamics of Computer Clubhouses. Just as LEGO MindStorms added programmability to an activity deeply rooted in youth culture (building with LEGO bricks), Scratch will add programmability to the media-rich and network-based activities that are most popular among Clubhouse youth. Taking advantage of the extraordinary processing power of current computers, Scratch will support new programming paradigms and activities that were previously infeasible, making it much better positioned to succeed than previous initiatives to introduce programming to youth. We expect that the use of Scratch at Computer Clubhouses will serve as a model for other afterschool centers in economically-disadvantaged communities, demonstrating how informallearning settings can support the development of technological fluency, enabling young people to design and program projects that are meaningful to themselves and their communities.